Lord, Let Them Win the Lottery Again! The lottery doesn’t discriminate against profession, race, current life stage and it has nothing to do with the winner’s intentions. 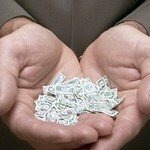 Usually lottery winners are in the spotlight for a short period of time. Once the dust settles, we rarely hear of them, ever again. However, there are those that tend to keep coming back. We live in society where living a lavish style attracts attention. Then again, they’re those people who like to get our attention with their good deeds and they always succeed. And you thought power and money corrupts us all. They may corrupt me and you, but here are few lottery winners who did the opposite. And you thought all of these are going to be about million jackpot winners. Well, here’s a surprise for you. Once upon a time a modest woman spent her last $2 to buy a scratch-off card. She did the drill and won $200. Now you probably expect her to spend her winnings on few more tickets or scratch cards, or maybe just spoil herself with a decent apparel item. Well, she didn’t. On her way home our heroine Sofia Andrade met this homeless person called Glenn Williams. It was rather cold outside and she invited him for a cup of coffee. She picked him up and took him at her place, made him a cup of coffee and they had a chat. Glenn was overwhelmed by the kindness and how she took him in to warm himself. She didn’t stop here. She started a campaign on GoFundMe.com. Sofia wanted to raise $5,000 for Glenn, but something else happened. In the end there were nearly $15,000 for Glenn, in just two days! I guess the $200 win was just the push she needed to do something kind. Note she’s a single mother. Let that be the reason why you can’t make excuses. There are things in life we don’t have control over. I don’t know what’s going to happen next month, next week, heck I don’t even know what’s going to happen tonight. Jack Maier won $300,000 in the SuperCash lottery after losing his beloved wife to breast cancer. One might think he’s going to travel the world in his late 70s and maybe comfort his loneliness with his hefty bank account. However, he started renting billboards all over his city. Myrna’s tragic death was about to become the alarm for many women. 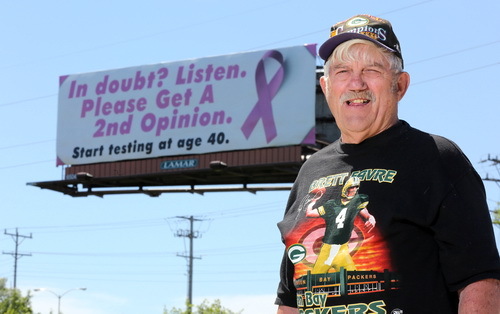 He rented billboards urging women to get mammograms. It’s a medical exam that determines if a woman is in danger of breast cancer. Jack even went a step further and urges women in his billboards to ask for a 2nd opinion if they’re in doubt. I wish there were more lottery winners like Mr. Maier over here. He states he’s not going to stop until he runs out of money. Bear in mind, one billboard costs $2,000 for a month. 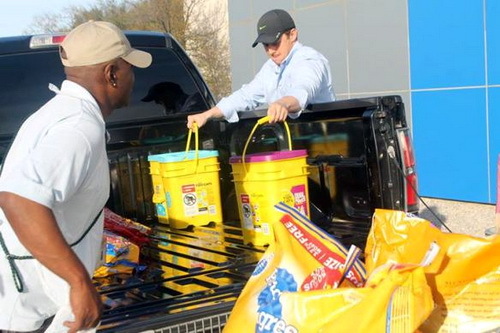 To an animal shelter, all of it, all $500 went to the Dallas Animal Service. The hero’s name is Bryce Vucekovich. He won $500 from a scratch-off lottery ticket and he knew exactly what he is going to do with the money. Bryce always wanted to donate a chunk of money to the local animal shelter. He obviously meant it when he said it. As soon as he cashed in the ticket he went straight to the local pet store to buy food and other necessities for the dogs and the cats situated in the shelter. He dropped by with this pick-up truck full with animal groceries so to speak. Bryce was the Santa Claus the animals have been expected for Christmas; he was late a bit, but just in time. This story in particular warms my heart and makes me feel good to be a lottery player, to share a hobby an interest with people like our hero Bryce is. It doesn’t take millions to do a good deed. What it takes is a kind heart and an idea what to do with your resources. I showed you how lottery winners helped a homeless man, helped an animal shelter and how a great misfortune made one our featured lottery winners donate his 6 digit lottery prize to raise awareness. What’s left? Children. A teacher coming from the most southern part of the world, Australia, had won $20,000 in a show. It’s somewhat of a lottery and she did a kind deed so I thought I had to make her part of our little kind lottery winners’ family. Bri Dredge lives in Ballart where winters can become quite cold. Since during cold weather the children have to stay inside, Bri had a marvelous idea how to spend a good chunk of her money. 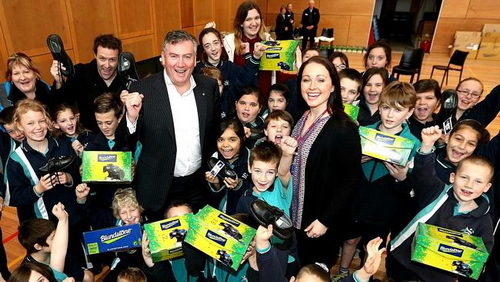 As soon as she got the money, she went to the local shoe shop to buy 200 pairs of leather boots that will keep most of the students’ toes warm and dry. Her idea was to buy shoes for her students so they can go out and enjoy winter, instead of staying inside all the time. This wasn’t necessary, but it was her way of showing kindness. 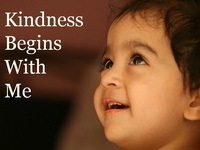 When’s the last time you did something kind without expecting anything in return? Are Single Moms Luckier in Lottery Than Married?